Ask any seasoned visitor to our lovely part of the world and they’ll tell you right away: the best way to really take it all in, to really get up close and personal with the sheer beauty and wonder of Doolin and beyond is on foot or by bike. The good news is, you’ll be stuck for choice, with a myriad of trails, walks and ways taking you off the beaten track, and all are sign-posted. We do believe though, that to truly get the most from your hike or bike adventure, we recommend you go with a guide – so here are a few you might like to consider. 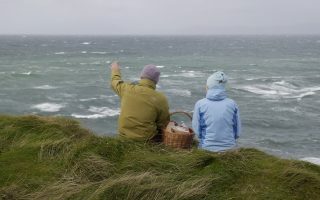 Local historian and farmer, Pat Sweeney, is your perfect guide for the Doolin Cliff Walk – a trail route that runs along the coast and above the Doolin cliffs. With green fields, cows, sheep and local farms on one side, and the wild Atlantic Ocean on the other, this is a unique way to experience the stunning views and breath-taking rural beauty of Clare. Pat Sweeney is an expert on local history and folklore and is passionate about the preservation of a rural lifestyle that has been enjoyed by five generations of his farming family. This walk starts just a couple of steps from our door in Fisher Street, Doolin, and takes around 3 hours. Tony Kirby offers a wide variety of guided walks in the majestic, rocky Burren and his tours have featured in No Frontiers (RTE TV travel series) and Mooney Goes Wild (RTE Radio wildlife series). The menu includes a summer-scheduled progamme in the Burren National Park, archaeology walks, spirituality walks and weekend walking breaks. There is everything from an easy, hour-long stroll to an invigorating day-long hill walk. All walks feature entertaining and informative commentaries on the geology, flora, archaeology, fauna, farming and folklore of the Burren. Offers you enlightening and exhilarating walks with knowledgeable local guide, Marie. Marie lives in the heart of the Burren, has a degree in Heritage and a deep passion for what she calls Wilderness Therapy. On the mountains of Sliabh Rua and Mullaghmore you will gain insight on this magical place, with its intriguing limestone pavement, diverse array of wild flowers and abundant wildlife. The legacies of past generations, the old farm homestead, ancient famine road and various monuments all feature in Marie’s walk – exploring the history of the land and its people as you go. Is dedicated to providing quality outdoor hill walking through the stunning and unique Burren, with a highly qualified and knowledgeable local guide. All levels of fitness and interests are catered for and there’s a wide range of tours to choose from. If you prefer, a guide can create a walk to suit your specific needs. A minimum of 2 people are required for these walks. offers half- and full-day walks, trail walks and climbs – with the specialized guidance of Christy who is a fully-qualified mountain leader and rock-climbing instructor. Christy has many years of experience leading and training in different mountain areas – from Wicklow and The Mourns to the Scottish highlands and the Alps. Now a resident of the Burren, Christy will lead you through this beautiful part of the world – sharing everything from majestic views to archeological highlights. For your peace of mind, Christy is also trained in mountain first aid. Oonagh O’Dwyer invites you along on one of her Wild Food and Foraging Walks – sharing her knowledge of food that is seasonal, local, nutritious and free. You’ll discover many edible types of seaweed, wild herbs, roots, flowers, fruits and nuts. You’ll learn to identify the different plants as well as how to forage sustainably. All walks include a picnic in the wild, using some of nature’s larder – while you can also learn about the many wonderful uses of wild food, by joining Oonagh’s cookery classes, or Wild Food Supper Club. Deborah Evers of Clareville House Kitchen Garden offers guided foraging walks on the Burren limestone and shoreline. She’ll show you how observation is the key and how to use ancient landscape navigation techniques to find your way, recording with your eyes, camera or sketchbook. The focus in the spring is on the Burren wild flowers, while edible food foraging is the emphasis come autumn. All guides we recommend are members and ‘friends’ of the Burren Ecotourism Network and adhere to the Burren & Cliffs of Moher Geopark Sustainable Code of Practice. Difficulty: Difficult. High levels of fitness required. Caution: exposed cliff top path. Cycling is one of the best ways to explore the Burren. Take a guided tour, hire a bike or treat yourself to an electric bike and just cruise around. The Doolin Inn, doorstep is the starting point for the Doolin Cycle hub, and there are maps and signage to direct you while you explore. Hire an amazing Kalkhoff electric bike and spend your day enjoying the scenery, while the bike helps you up the hills. A typical guided tour will include some of the most beautiful spots in Ireland (and some of its best kept secrets). Groups are kept small – a maximum of 8 people – ensuring you get the most out of the experience. For bike hire, E-Whizz will deliver to Doolin Inn and discounts are available for multiple days and more than two bikes. An early morning guided cycling tour through the heart of the Burren followed by a delicious mouth-watering breakfast at Burren Fine Wine and Food. This experience was acknowledged as one of National Geographic’s Top 10 Activities along the Wild Atlantic Way in 2014 and included on Failte Ireland’s original 50 Secrets of the Wild Atlantic Way. It also featured on RTE’s Eco Eye programme. Bicycle hire is also available with delivery to Doolin Inn. This is a short trip following the coast road to the Cliffs of Moher and back via Knocknalarabana – the hill overlooking Doolin. Cyclists will pass the round tower of Doonagore Castle and should prepare for a severe climb. You’ll stop off at the famous St. Bridget’s Well, situated approximately 300-400 metres south of the Cliffs of Moher, or enjoy a walk or swim at Lahinch beach. This route can be shortened just before O’Briens Bridge, which lies just north of Lahinch. Follow a peaceful, scenic route towards Kilfenora then visit the famous Poulnabrone Dolmen in the heart of the Burren. Constructed around 3500BC, this is one of Ireland’s most distinctive landmarks. You’ll take the coast road, with spectacular views across to the Aran Islands. There are challenging climbs over Slieve Elva – or if you prefer, at Kilmoon Bridge, before the mountains, you can head inland to Lisdoonvarna.